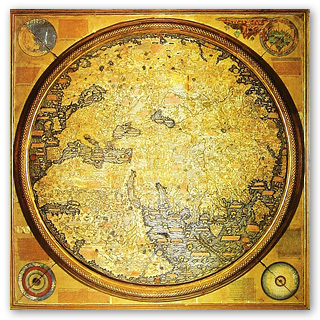 The Fra Mauro map of the World "1450" did left its home in the Biblioteca Nazionale Marciana in Venice for an exhibition to the national library of Australia which was held from 7 November 2013 to 10 March 2014. It began on a canal in Venice and ended via a specially deconstructed National Library of Australia window. It was too big to come through the front door, but one of the rarest maps in the world, the 1450 Fra Mauro Map of the World, has finally taken pride of place in our exhibition Mapping Our World: Terra Incognita to Australia. Years of planning went into bringing this 2.4 metre square treasure, "the greatest of all medieval maps", to Canberra—not only because it had to come across the world, but because in its 600-year-life, it had never left its home in the Biblioteca Nazionale Marciana in Venice for an exhibition.